He said focus. The word focus. I hear angels singing. Everything goes dark except for a light that beams down on Sean. It is a God-given sign- like when people see the Virgin Mary in their grilled cheese, except this isn’t religious and I’m actually not a big fan of dairy. I stare at the back of his head. His HEAD. Something I see every day but never really see because it’s been there forever. Since the first day of third grade. I crumple up my web. I don’t need it. Praise be, the Focus Gods have spoken. I am going to write about Sean Griswold’s Head. According to her guidance counselor, fifteen-year-old Payton Gritas needs a focus object-an item to concentrate her emotions on. It’s supposed to be something inanimate, but Payton decides to use the thing she stares at during class: Sean Griswold’s head. In the first few pages of Lindsey Leavitt’s Sean Griswolds Head, I found myself thinking this was too young and immature for me, but it wasn’t long before I was hooked into a story that has fold upon fold of serious and not-so-serious issues. Payton, whose point of view the story is from, is a young high school girl who excels at everything she does. There’s nothing she doesn’t do or handle well until she stumbles upon her mother giving her father an injection which they clarify isn’t for recreational purposes—her father has MS. They just change. Their body changes. Their abilities - the things they do that make them who they are - leave, sometimes temporarily, sometimes forever. Every day they wake up with that big what if? And nothing is scarier than a life filled with what ifs - living by day without predictability and control. Some people end up losing feeling. Some have uncontrollable spasms. Some can’t function. Some end up blind or in a wheelchair. Some end up bedridden and paralyzed. It’s hard to know who “some people” will be. From this point, I really loved Payton—especially her sarcastic, self-deprecating voice—yet still did a great deal of groaning at her faulty decision making and even weaker stabs at holding together and then destroying her relationships. She is young and immature but learning to grow and build on her newly discovered strength to face obstacles she never dreamed would come into her life. Payton’s world evolves as she discovers that people are not all that they may appear. Teachers can love and suffer loss, her guidance counsellor isn’t as nutty as Payton thought (she’s simply human with her her loves, sorrows and losses), her best friend’s a treasure she didn’t know she had, the object of her romantic fantasy’s truly a fine person and her family’s the backbone of who she is. Payton discovers how to give of herself, when and how to let go of preconceived notions of people based on what’s seen from the outside. This is a thoughtful journey into the complexity that humanity requires. It’s also a sophisticated coming of age story. If you like a book that doesn’t hide from the painful realities of life, of strained relationships, of love both romantic and familial, of deep friendships and finally of hope that soars above the sorrow life can bring, then Sean Griswold’s Head is for you. I found myself thinking about how I’d faced difficulties in my life and of how I could learn from those Payton faced and sometimes hid from. I would be lying if I said I didn’t get a kick out of the assignment. Here I am, a “troubled youth,” and my self-chosen treatment is to become a stalker. Okay, not stalker. Research Analyst. Leavitt’s characters are alive with humanity, depth, sorrow and the joy of love, friendships and family. I enjoyed reading the book more and more with each turn of the page. 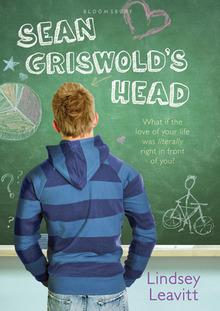 Note: Sean Griswold’s Head is currently only $1.99 for Kindle.